A truly unique and beautiful game.......one of those rare gems. Back when baten kaitos was first released many years ago it was one of those games that literally made my eyes pop. Just from the box art alone it felt as though this RPG would be grand and epic did it live up to my expectations? Baten Kaitos's story starts off very slowly. In the game, you are a Guardian Spirit, a spirit from another world, bonded to Kalas, the main character. Your role is to protect him and help him, although you don't know anything of his past, yet. The story takes place in a world where its winged inhabitants live on floating islands and where the ocean is said to have been sucked up by a god long ago. Strangely enough, Kalas only has one wing, the other one being mechanical. When you first meet with him, he is about to leave on a journey to avenge his grandfather and brother's deaths. As he starts his journey, he meets with a girl by the name of Xhela. Although Kalas really doesn't want her to get in his way, she insists of coming with him, as their respective goals seem to lead the same way: the emperor, who seems to be plotting something related to reviving the wicked gods that caused the lost of the ocean long ago. May seem like a typical story (it is), but as you go on, some plot twists may cause you a heart-attack at some point in the game. Unfortunately, the main disappointment could be the shallow party members, but Kalas makes up for them, as I thought he was an excellent character. Graphically, Baten Kaitos is a very impressive game. The pre-rendered backgrounds used in the game are beautifully detailed and give towns charm and a very unique atmosphere. The sceneries are simply beautiful and there are so many details that you could spend hours scrutinizing the backgrounds. The world maps for each island are what's the most impressive. Just a quick look a them makes you feel like exploring every inch of them. My only grip with the pre-rendered backgrounds was that there were times where I felt more as if I was moving a character in a pretty painting rather than exploring the environments, due to the fixed camera angle. I also have to take off some points for the blocky 3D character models that contrast with the superb pre-renders, and while the animations during the battles are top-notch, the 3D environments shown during them are not on pair with the pre-rendered ones used in the rest of the game. As you probably already know, Baten Kaitos is an RPG featuring an epic quest and a card-based battle system, but I'll cover this later. In the game, you play as a guardian spirit watching over Kalas and must help him make the correct choices throughout the adventure, which are supposed to affect the ending of the game. As your typical RPG, the quest starts off in a small peaceful village, but soon enough, you and Kalas must venture outside and traverse dangerous lands inhabited by ferocious beasts, in order to reach the next town, usually bigger and more lively. 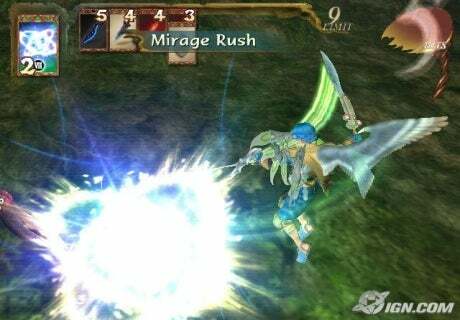 In Baten Kaitos, gone are the endless bland fields you must traverse on the world map in order to reach the next location. You can see the location you must head for on the world map, and must simply walk to it with no encounters with enemies. While it makes traveling through the different locations on the world map less annoying and quicker, it does take out a bit of the exploration feel you usually have in other RPGs. One thing I was a bit disappointed of was the way the islands were so beautiful and seemed so large, yet I couldn't explore them fully. A large portion of some islands were left unexplored. For instance, I could see a mountain drawn on one of the islands, but the party just never stops at it. It left me with the feeling that I wasn't seeing as much of the islands as I would have liked. Hopefully, there is still a large number of beautiful areas and towns to explore in the game. The areas you will journey through during the adventure are each quite distinctive depending on which island you are on, each island having its own respective theme. The areas you'll be visiting are quite simple, they are not overfilled with puzzles and the scenery is beautiful thanks to the pre-rendered graphics. Monsters roam freely as you explore the areas looking for hidden treasure chests, but you can see them, and therefore avoid them if you're not feeling like fighting. What will mostly catch your eyes are probably the towns. They're beautiful, unique and atmospheric. Sadly, once you start exploring them, you'll find out that they're pretty small although they look quite large. There are a lot of side quests though, and like always, you can freely enter any house and search in the villagers' things to find rare items and make them yours to keep. This brings me to talk about the Magnus, which are the heart of the game. Magnus are the essences of objects in this world that you can trap in blank cards and keep on you while you travel. For example, you can trap the essence of the fire from a fireplace in a card and use that card on a tree trunk to burn it down. You can trap a lot of different essences in your cards, including water, snow, flowers, lava and various other things you'll come across during the adventure, each having its own unique use. Another interesting aspect of the Magnus are that they age over time. If you wait several hours, the snow will eventually turn into water, for instance. You'll probably also notice that there are no inns or weapons/armors shops in Baten Kaitos. You can't equip weapons and armors to your characters, as the weapons and armors' essences are contained within the cards you use for fighting. Each town has one shop, a shop where you can rest and buy/sell Magnus cards. The cards you buy in shops or find in treasure chests are usually the ones you'll use for the battles. The cards vary from weapons, armors, healing items and various other magnus. Each of your characters has its own deck, a deck you will need to fill up with the right cards in order to come up with a balanced deck. Obviously, if you get stronger cards later on, you will need to replace the weaker cards by these stronger cards in your deck, but always keeping a balanced number of attack, defense and healing cards. The battles are quite easy to handle and understand. At the start of a fight, cards chosen randomly from your deck will be shown on the screen. While the fights play like turn-based battles, there is a bit of real-time involved, resulting in a very unique and strategic battle system. When your character's turn to attack comes, you have a set number of time to choose what cards to use against the enemy and try to pick them up in a special order to make combos for extra damage, depending on the spirit numbers shown in the corners of your cards. After the attack turn where you can choose to attack the enemy or heal yourself up, you will have a turn to defend yourself against the enemy's attacks. Three of your party members can participate in the battles and each have their own special cards and finishing moves. For example, Kalas attacks with swords and defends himself with shields, while Xhela uses spells and defends with capes and hoods. This new type of card battle system feels really refreshing after all those RPGs using the traditional turn-based system. The music is enchanting and atmospheric, suiting perfectly whatever area or town you are in, and fits every situation with perfection. While the towns and areas' music is rather calm and restful, the battle music is more lively and really keeps you on your toes. However, the music does tend to repeat in some areas and towns. The voice-acting also lowers the score a bit, as the characters seem to talk through a pipe and some voices don't go along too well with some characters. Luckily, you can turn them off if you're not willing to hear them. Baten Kaitos is a fairly long game, lasting 50-60 hours for the average gamer, plus a 20 hours if you plan on completing every single side quest and even more if you try to collect all 1000 Magnus cards. As for a second or perhaps even a third play through, the game is enjoyable enough, but probably not for a fourth one. In conclusion, Baten Kaitos is a great RPG experience that any RPG fan most definitively needs to try out. Even if you're not inclined towards card RPGs, give this one a chance and you'll most certainly be surprised by the fun and addictive battle system. So what do you think of this hidden gem on the nintendo gamecube? Let us know and don't be a jimmy.